Receptor Tyrosine Kinases (RTKs) are membrane bound kinases that are activated upon binding of receptor specific ligands. They make up the largest class of membrane receptors that trigger signaling cascades through their inherent enzymatic activity. These structures, activation mechanisms and key components of the signaling pathways are highly conserved in metazoans. There are 58 known RTKs in humans, which are grouped into 20 classes depending on topology. 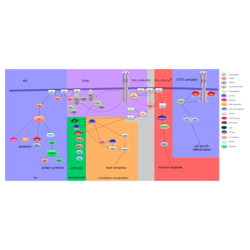 RTKs are fairly promiscuous receptors, and activating stimuli comprise a plethora of growth factors, hormones, and cytokines. Most RTKs form dimers and become active upon ligand binding. The active RTK phosphorylates activators of downstream signaling cascades such as NF-kB, MAPK, Ca2+ dependent signaling, and the JAK-STAT pathway. RTKs affect a wide spectrum of processes ranging from cytoskeleton dynamics, cell growth and differentiation to inflammation, apoptosis, and tumor progression. In spite of the exceptionally high variety of receptors and outcomes, RTKs engage only a limited set of core processes. Therefore, quantitative analysis of factors like an RTK’s expression profile are crucial for the understanding of the signaling processes and predicting qualitative outcomes.